Think of a Rolex. It immediately exudes a sense of awe in the mind. Rolex is beyond a timekeeper. It is a brand that stands for legacy, for greatness. When you think of Rolex, you think of the dazzle, you think of the legacy of Martin Luther King Jr or JFK or Roger Federer. After all those thoughts, all those imagery, will the thought of a timekeeper come to your mind. Therefore, when you are paying for a watch like Rolex, you are paying the steep premium for its brand. Creating a brand is the biggest challenge for any luxury label, especially in the minds of price-sensitive Indian consumers. Every brand has its own story and thus its growth will have a unique trajectory. Replication of a similar projectile is doomed for failure. So how can you, as a brand custodian and communicator make a brand demand a premium in the luxury space? This is the tale of the origin of the brand — the product may be produced in a remote hamlet in Venice or it may be handcrafted in a lesser-known Swiss village or it is the legacy used by greats or sourcing it takes years or your brand was used by Maharajas so there is a royal lineage to it. For example, Shahtoosh, a Persian word meaning king of fine wools, is a shawl, which is woven with the down hair of the Tibetan antelope by master craftsmen and women of Kashmir. It takes years to just collect the wool. It is the story that sells. It is the story that needs to create the luxe factor, the aspiration. 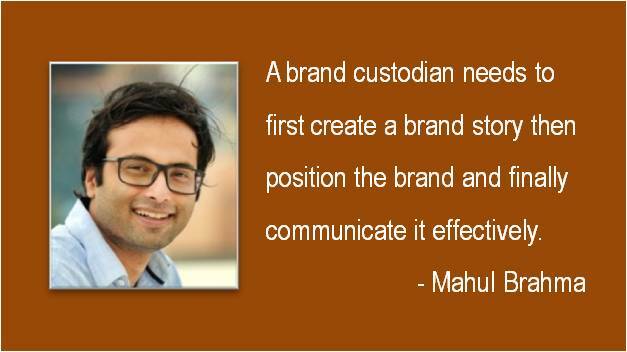 So for a brand custodian it is imperative to first frame the story, then position it and finally communicate it. This story has to be your brand’s story and will basically have the raison d’être of the brand. Remember it is the story that is getting you the premium so it is critical to have a few elements of why the brand came into existence, the unique value proposition, the promise of exclusivity, the promise of class and if possible, a legacy. Once you know the story, you need to figure the positioning of your brand. If it is looking at a legacy, you need to showcase achievers and how the brand is only associated with winners. For example, Federer and Rolex. However, for a new watch brand which is made in India and sans Swiss backing, it is better to find refuge in Royalty. So script a story of how this watch is the favourite of the Nawab or the Maharaja. So the brand building will be done for a different positioning altogether, not competing with Rolex but creating its own niche. The consumer segment will have the following characteristics: Rich upper middle class, majorly male in the age group of 40 and above, businessmen/high ranking corporates/lawyers and mostly frequent business travelers. It is to make the owner feel like a king. He may own a Rolex but these will be exquisite pieces representing our Royalty, which is a very unique positioning compared all the Swiss brands. So, know your competition and its space, and then create your own positioning and build on that. Communicating the Brand Story: The idea is to create an aspiration factor through every channel of communication — be it advertisements or news coverage or through the boutique managers. There has to be consistency in the message at every moment of discipline (EMOD). This is the most critical part of the entire process chain. Every communication needs to communicate the same message to the audience, of course, in very different ways. But the take home or brand recall needs to be uniform. Elaborating through the luxury watch brand example; the brand elements that your story is communicating are: Luxe, hand-crafted, unique, legacy of royalty – adorn by kings, style and class. It is a clutter-breaker from the Swiss watches. The moment you think about this watch you need to get an imagery of Maharajas. With this luxury watch strapped on your wrist you become a part of that much-aspired Royalty. So the advertisements will typically have a royal setting with a simple messaging of exclusivity. Not everyone can afford it. However, you can. So come and be a part of this legacy. You have the money but your blood may not be blue. This lure needs to increase with every passing year as the brand evolves. On the PR front, the stories need to concentrate on the legacy and how this watch is the favourite of certain Maharajas or Nawabs. The stories should also focus on the unique value proposition of being handcrafted by traditional watchmakers, giving a glimpse of the painstaking process of making this watch. Louis Vuitton in an advertisement showcased how its trunks are stitched manually and not by machines. It is to showcase how it is worth the premium they charge. It is a different story that the ad ran into a controversy. To conclude, I will say that a brand custodian or communicator needs to first create the brand story then position the brand by identifying the niche. And finally communication, communication and communication.